Thanks to Shahnaz Quayyum for sharing wonderful recipe. Though I try to keep my touch. 1. 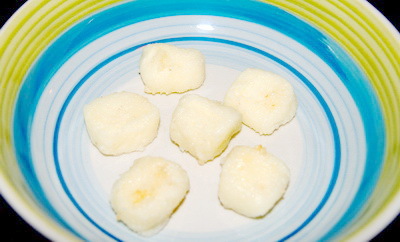 Make chhana/ homemade cheese to follow my recipe. 2. Add cardamom with cheese and knead it well. 3. 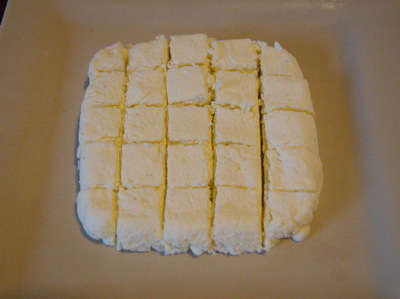 Shape it like the picture and let it sets in refrigerator for ½ hour. 4. Add sugar and 1/3 cup water on stove and make it two thread sugar syrup. The syrup thickens and becomes sticky. 5. When white bubbles start to show from bottom,Take out the cheese from refrigerator and cut into small cube and add cheese in syrup and cook for 2 minutes. 6. Take out cheese from syrup and put on icing sugar. (If you put cheese straight on plate, it will stuck on plate). 7. Enjoy Chanamukhi chilled or room temperature. Tips: Sugar syrup needs to be crystallized over cheese cube. So make sure syrup in right consistency. I tried your puishak with chicken.It was really good. My husband was very happy. tell me where can I get cheese cloth in Australia. I mean which type of shop sell cheese cloth. Thanks. I feel good when I hear that somebody is trying my recipe. For cheese cloth you can check kitchen shop. I use strainer for that. you can get in all supermarkets. huge compliment …thanks a lot. I tried your recipe to make chanamukhi. The chanamukhi I made is softer than the chanamukhi we see in Brahmanbaria. How can I make it little hard. Hi! squeeze water from cheese(chhana).Hard cheese will make hard chanamukhi. Thaanks. Would love to try chanamukhi. can i use blender to knead cheese. 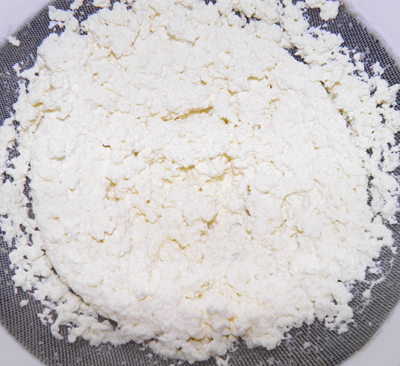 You can use food processor to knead cheese. Remember we dont want ay excess water in cheese. Hi, How are you doing? I have recently move to Cairo, Egypt. Long time I haven’t got chance to try some of your recipe. I have just made Chanamuki. Chanamuki seems ok, but little bit softer than usual. I was little bit confused while following the recipe. For example I had no idea what is two thread sugar syrup. I got some idea from internet. I think, I couldn’t make the syrup properly. I have tried my best to squeeze all water. So chana seemed fine. Another confusion was, should I turn chana while boiling in syrup? When should we take out the chanamuki from syrup, hot or cold? I am sorry that I have always long inquiry.But I want to make perfect sweets. I appreciate your time and effort to reply your readers. Hi! Nice to hear from you. hope that you are settle now in Cairo. I like your detailed long question. I could feel that you read and tried carefully. For this recipe or for any Bangladeshi sweets Syrup’s consistency is an important part. Sugar syrup needs to be crystallized over cheese cube like goja. So make sure syrup is thicken enough. I edit detail about syrup , hope it will help. Add cheese cube after you see white bubble in syrup. I am very proud to have readers like you. Thanks. Thanks for your quick reply. I am gonna try it again right now and let you know. I know beson flour’s halua recipe. Keep on eyes , I will post soon. Thanks. Hi, sorry for late reply. I have tried to make chanamukhi again, but I failed. So I gave up. this is the only sweet I failed to make after several try. dont give up. try with store bought cheese cube(Indian paneer cube) but please dont give up.